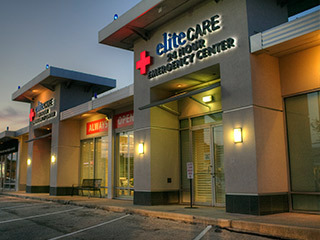 Elite Care 24-hour Emergency Room of Houston provides all the services offered at a traditional hospital emergency room with the added benefit of short wait times, a convenient and clean location, and superior service. We are fully staffed with Board Certified, highly trained physicians. With highly-experienced doctors and modern equipment, it is clear that we are committed to providing you with the best and fastest medical attention available. Imaging Services: With a full service Radiology department, we are capable of obtaining and providing results promptly. All of our Radiologist are Certified and Licensed. Laboratory Services: Complete laboratory testing; performed right in our emergency room by our emergency staff. These test results are available for prompt diagnoses within minutes. Elite Care 24 Hour Emergency Room has all the benefits of a hospital emergency room without the agony of waiting for test results. Pediatric Emergencies: Children are given the highest priority and are typically brought straight back to a comfortable and private evaluation room. Not only will your child be expedited to a private room, but they will be seen on a priority basis by our physicians. Check-out and discharge from Elite Care 24-hr Emergency Room are also given special attention so that you and your loved ones can return home promptly upon completing treatment. In the event that a patient requires a hospital stay, our staff can admit our patients to area hospitals. Having several emergency exam rooms, Elite Care is ready for you and your emergency 24 hours a day, 7 days a week. We are your neighbors and provide our signature service to all Inner Loop neighborhoods, including Morningside Place, Southhampton, Southgate, Old Braeswood, Braeswood Place, Sunset Terrace, Montclair, Greenbriar and Knollwood Village. We are straignt down University Blvd from Memorial Herman, Houston Methodist Hospital, Chi St. Luke’s Health, Texas Medical Center, Ben Taub Hospital, and Texas Children’s Hospital. We offer total emergency care, services, equipment, and board-certified doctors around the clock straight down Kirby Drive from Lower Kirby, Upper Kirby and River Oaks.